Switch up your slider game with my Crispy Mini Pretzel Sliders. Two-bite sliders with a homemade honey mustard dip are perfect for game time! Game day is upon us and nothing is better for snacking while cheering on your favorite team than some crunch snacks. 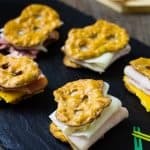 While houses are busy putting out a spread of sandwiches, chicken wings, and various snacks, I am putting out “snack sandwiches” with my Crispy Mini Pretzel Sliders! A slider is a small sandwich to begin with but sometimes I get overwhelmed with the ratio of bread to filling even in the smaller portions. 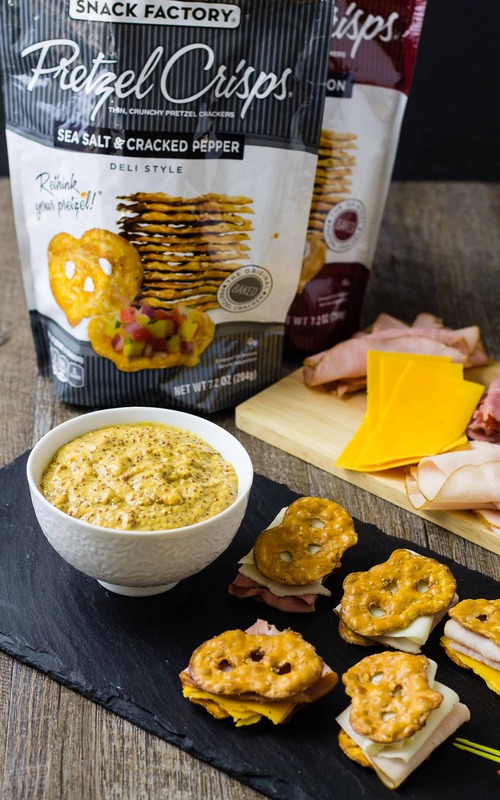 To keep me cheering for a few hours I need protein along with my crunch so I combine my favorite meat and cheese with Snack Factory® Pretzel Crips®. The Snack Factory® Pretzel Crips® make the perfect slider “bun” and provide crunch and additional flavors. Just think of the combinations! Game Day calls for lots of crunchy snacks and foods. I also like to include lots of meats, cheeses, olives, and some fruit too! Whatever you put in your spread, make sure you vary the flavors and textures! Having lots of different options means that everyone will find something they like and keep their tummies happy. After all, keeping your guests happy is almost as important as cheering on your team and sending them good luck vibes through the television. 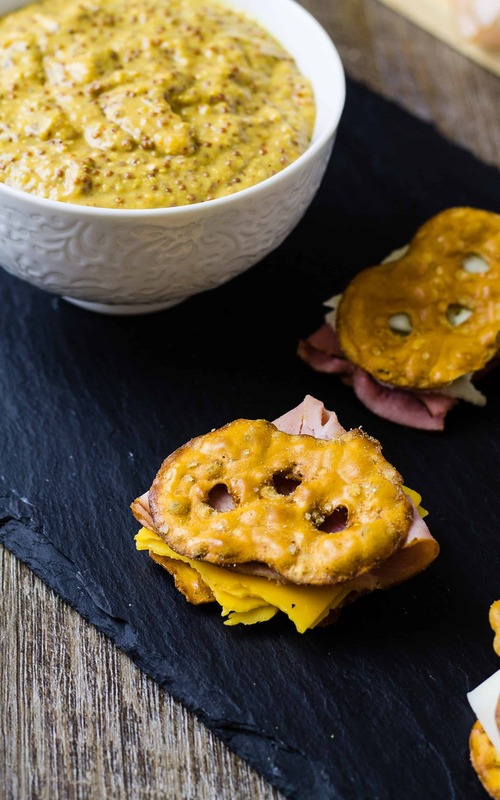 Assemble the Crispy Mini Pretzel Sliders with ease! 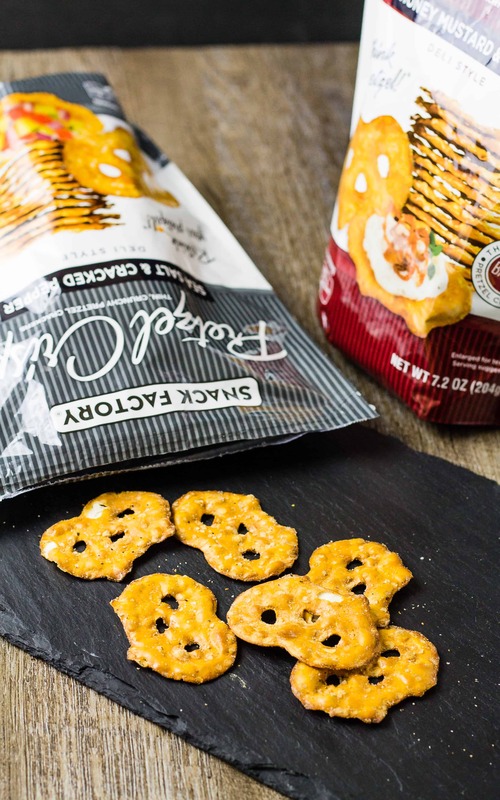 Just grab your favorite meats and cheeses and a few bags of the Snack Factory® Pretzel Crips®. Of all the flavors that are available, including a gluten-free option, the Sea Salt & Cracked Pepper is my favorite. It goes well with any meat and cheese combination. The other flavor I chose to mix well with the honey mustard dip is the Honey Mustard & Onion. 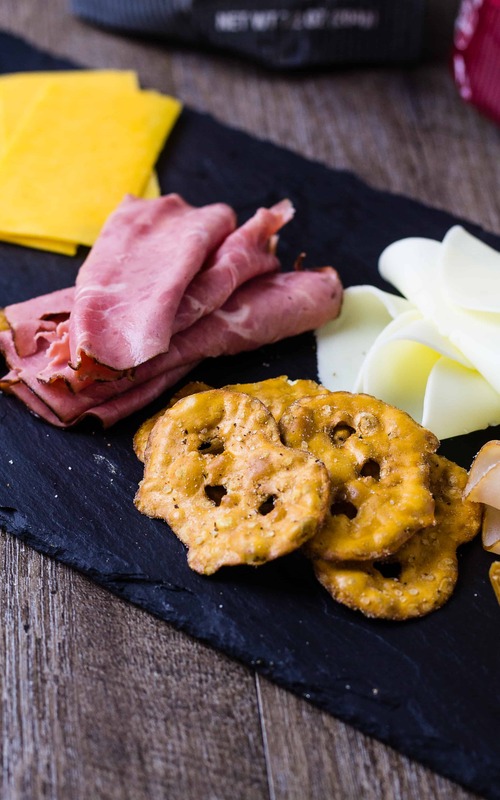 A combination of roast beef, cheddar cheese, and thePretzel Crips® Honey Mustard & Onion flavor is the best! Don’t discount the Everything, Garlic Parmesan, and the spicy Buffalo Wing flavors. They will add spice and zing, along with crunch, to any snack occasion! 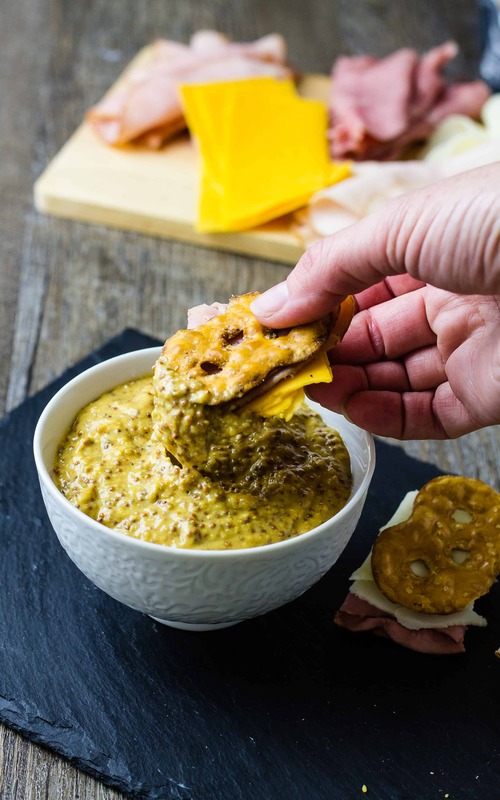 My homemade honey mustard dip is a riff on my favorite honey mustard recipe from my friend Michelle. I just added a bit of my homemade pickled mustard seeds to kick it up a bit and add a little more texture. I made the homemade pickled mustard seeds when I made my Honey Mustard Cheese Ball not too long ago and it was a huge hit! 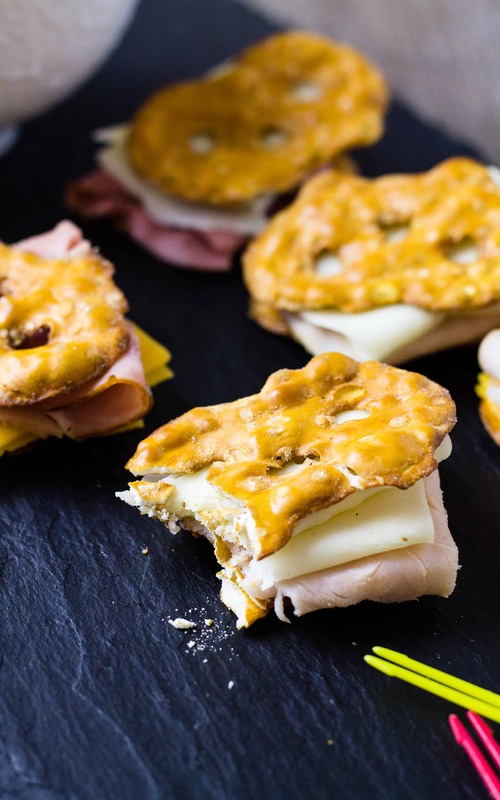 My Crispy Mini Pretzel Sliders are a great addition to your winning Game Day spread and keep all your guests happy and cheering! Grab even more inspiration here when the big game is starting and it is #TimeToCrunch! Combine all the ingredients for the honey mustard dip. Store in the refrigerator until ready to use and up to a week. 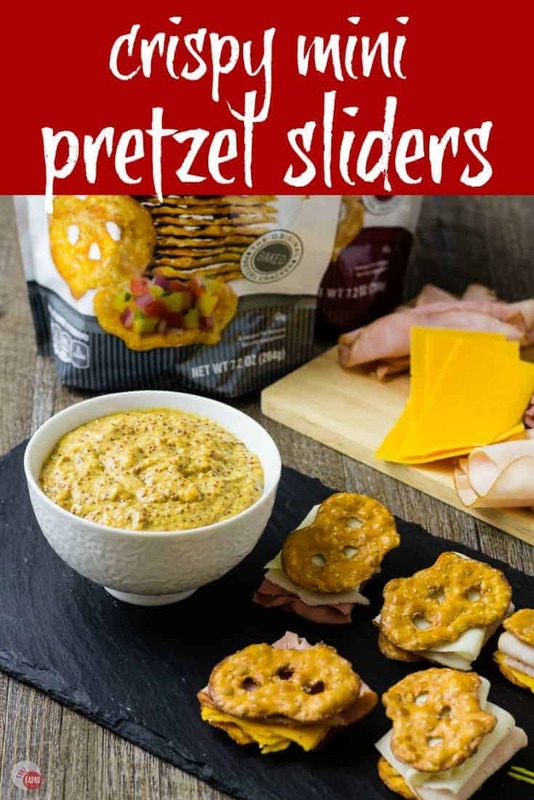 Add the meat and cheese of your choice between to Snack Factory® Pretzel Crips®. « Homemade Pot Stickers – Perfect Party Food! These sound super fun. I can’t wait to try the dip! You will love the crispy pretzels! Hi, Jennifer! Yet another great recipe that kind of made me hungry instantly. I can imagine serving this not only for the game but parties and any friend gatherings. I was wondering, what do you think goes perfectly with this when it comes to drinks?